I wear denims everyday, it’s like my uniform. As everything, after a while they become old and have holes. As I hate to throw away…even old clothes, I try to find ways to upcycle things. 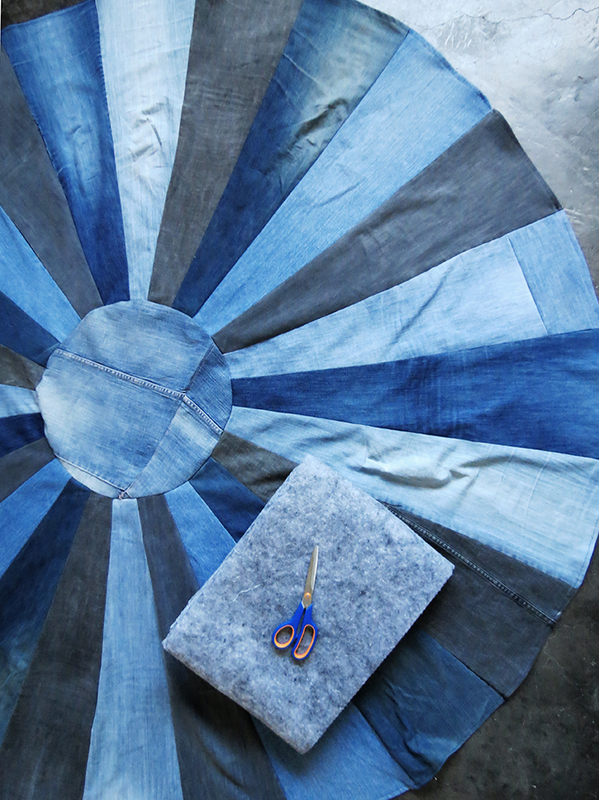 I already made a recycled denim basket, this time I give a try with a DIY rug. I love how it turns out. It’s not very complicated to make but it does take time to cut out and sew the fabric pieces together. 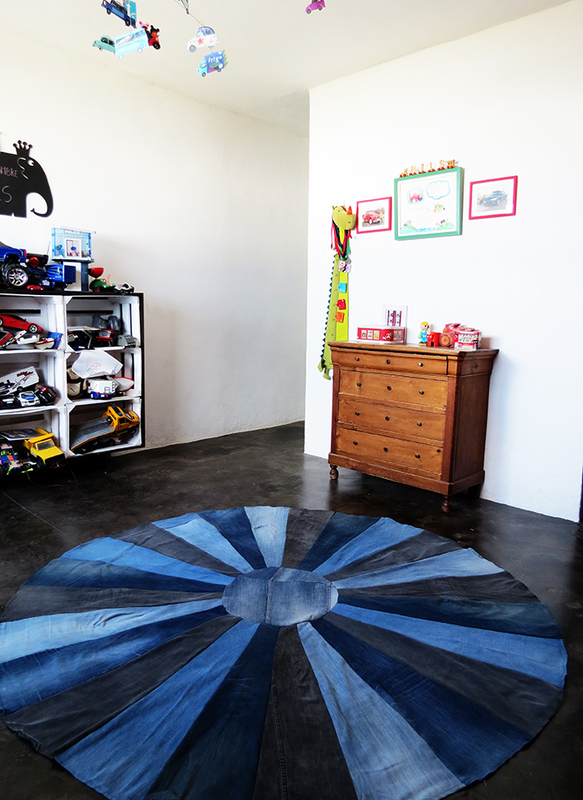 The result totally worth the time, and my son have a nice rug to play on his bedroom. The first thing you need to do is drawing the pattern to cut out the pieces. Take some paper or cardboard you have around and trace a trapezoid. The large base dimension is 9 1/4, the high 27 1/2 and the small base is 2 inches (in centimeters this will be: 23.5 cm for the base, 70 cm high and 5.5 cm for the small side). 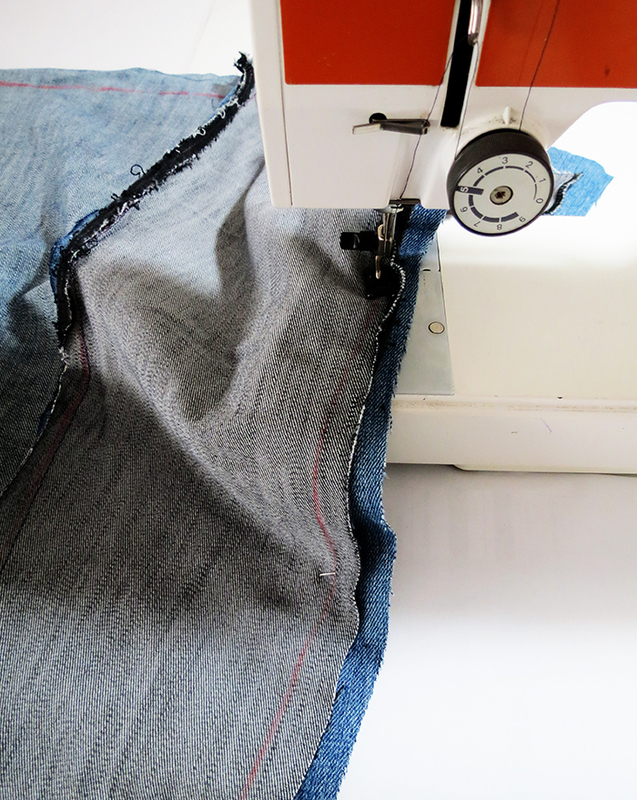 You report the trapezoid shape on the denim and you cut out the piece, leaving 1 inch around for the seam. A lot of cutting after you are ready to sew the pieces together. Put two pieces wrong side on wrong side, and sew the long sides together. Repeat with another piece, and another one…until you finished the circle. 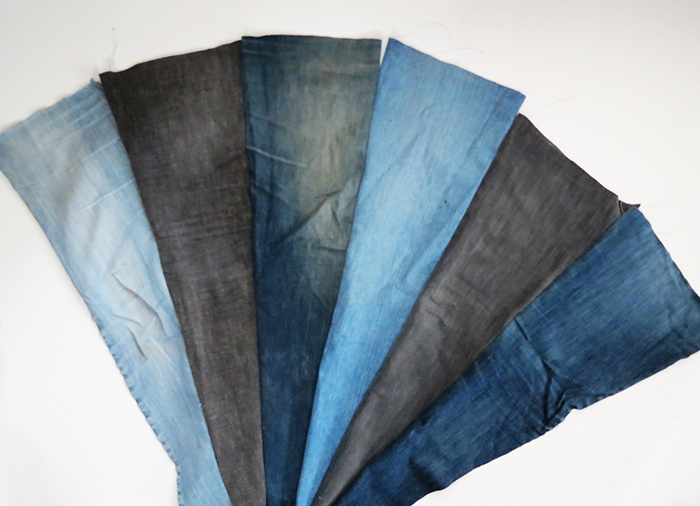 I had different denim colors, so I mix the pieces. 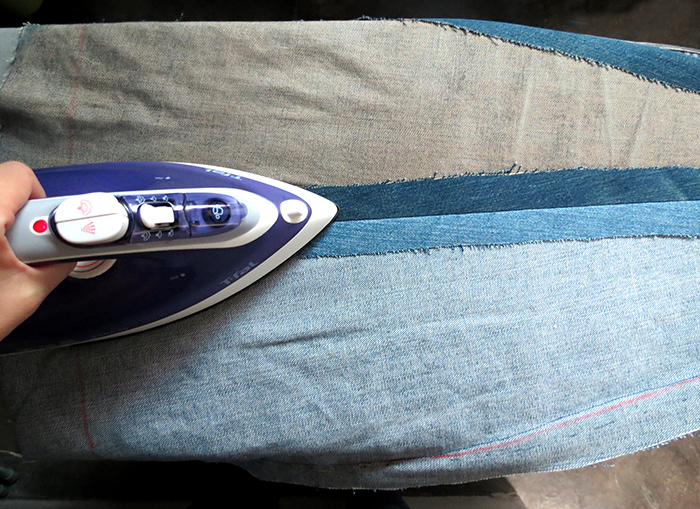 When all pieces are sewn, iron the seams. Don’t skip this part if you want to have a nice flat rug! Here we are, almost done. Fold the edge through inside and make a seam. 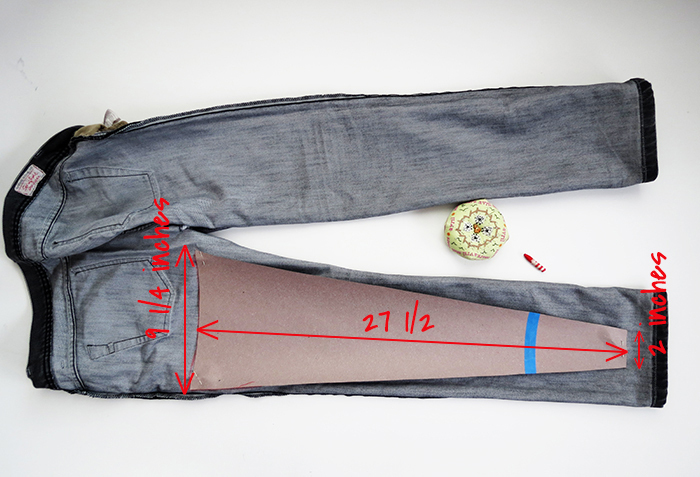 Take the last pant and cut a circle of 1 1/2 feet (43 cm) in it. It’s fine if you need to sew fabric pieces together to make the circle. 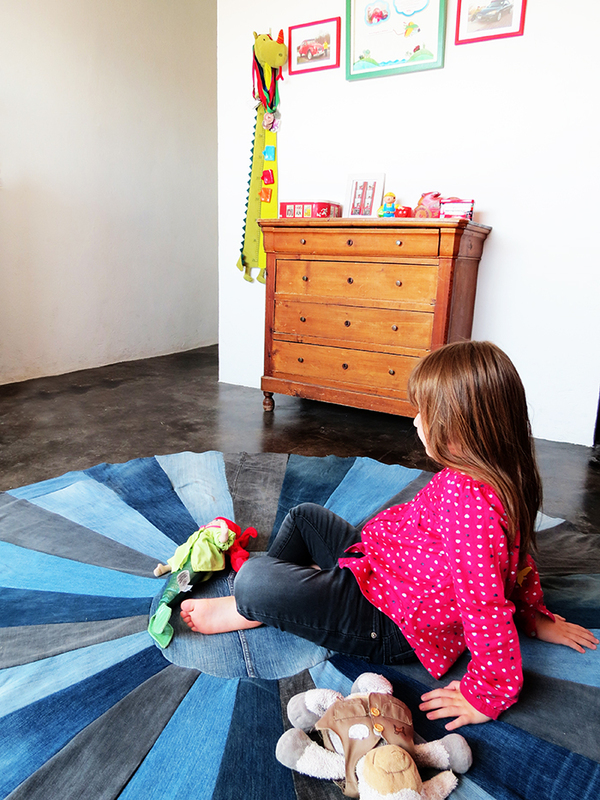 Pin the circle in the center and sew it with the rug. Iron the seam. The rug is done! Happy dance! Last and important step, if you want to avoid accident you need to put an anti-slip underlays. I use an ikea one and trim out the corners to fit the circle shape, but there is plenty of other options. And now you can make a safe and happy dance on your new rug! So what do you thing? 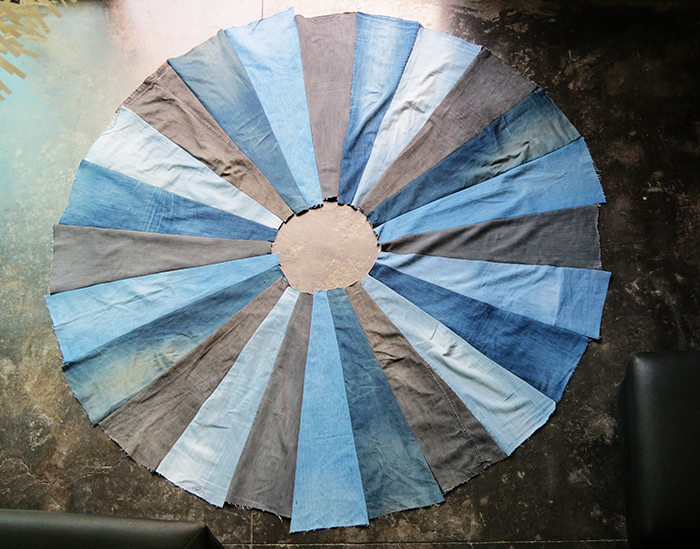 Any other fabric we can use to make an upcycled rug? If you like the crates storage in the picture below, take a tour HERE for the tutorial. Let me know how it turns, and don't hesitate to leave an other comment if you need some help! Thank you so much for this awesome tutorial! This rug is about to become a skirt! My daughter has an upcycle challenge for 4h sewing this year, my youngest thinks this is perfect! Hello Anna, great idea to make a skirt!! Let me know how it turns! Wow it’s a wonderful l lesson. We know lot of things on this article. A denim jeans is my favorite it’s too much comfortable and fashionable. I love this idea! 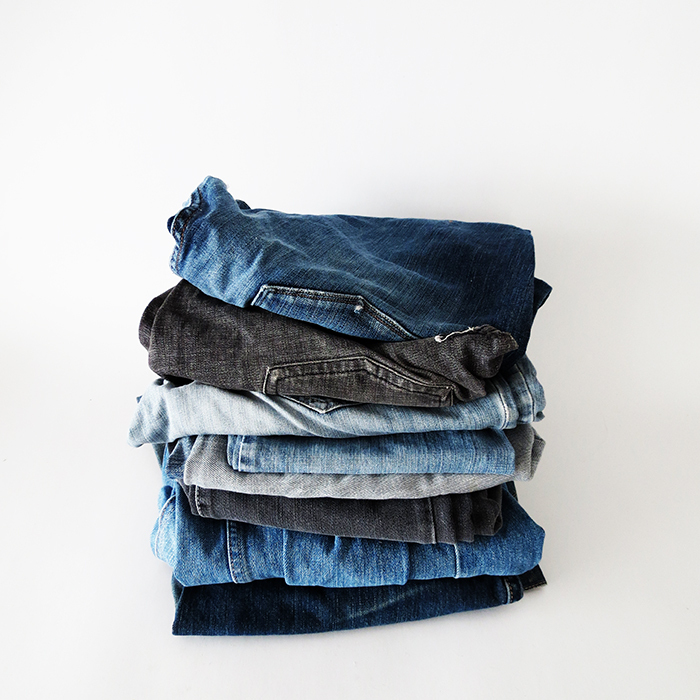 I have five boys and I'm sure you can imagine…we go through jeans! 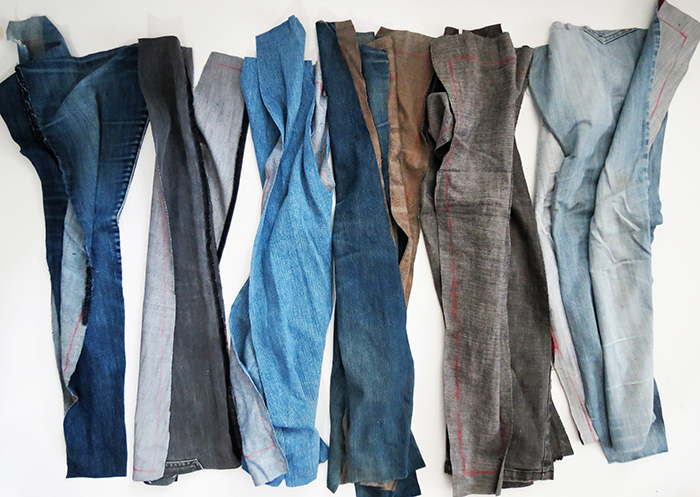 I have boxes, upon boxes (upon boxes) of denim! I can't wait to make this rug! 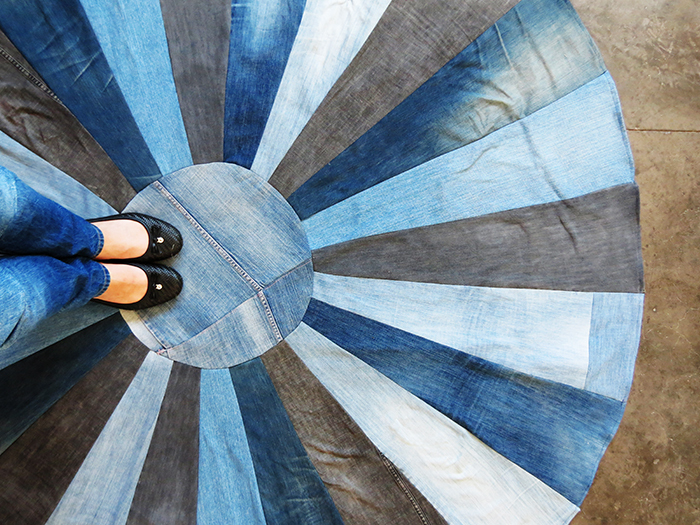 I can imagine that with five boys you may be able to make a denim rug for each room of your house! Have fun sewing, and don't hesitate to share it! I would love to see your finished rug! Thank you for sharing you photos and tutorial. 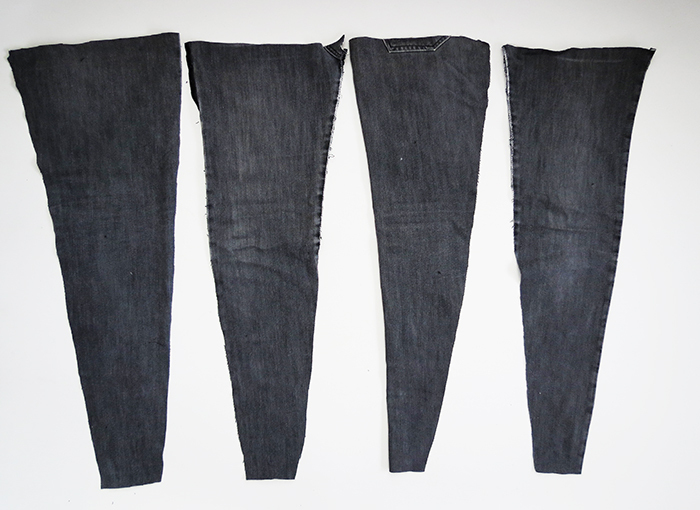 I had several old pairs of jeans from when I was size 0/2. I saved them thinking I'd shrink myself back into them. My relationship with these old jeans was unhealthy so, I decided to transform them & our relationship into something different. This was my first sewing project and I'm happy with the way it turned out. The smaller jeans barely had enough fabric so, I had to include more of the jeans' seams. I like the way the seams look, though. I backed it with an old quilt so, it can be used as a throw quilt or a rug. I'll send some photos to you. Great rug! Thank you so much for sharing! 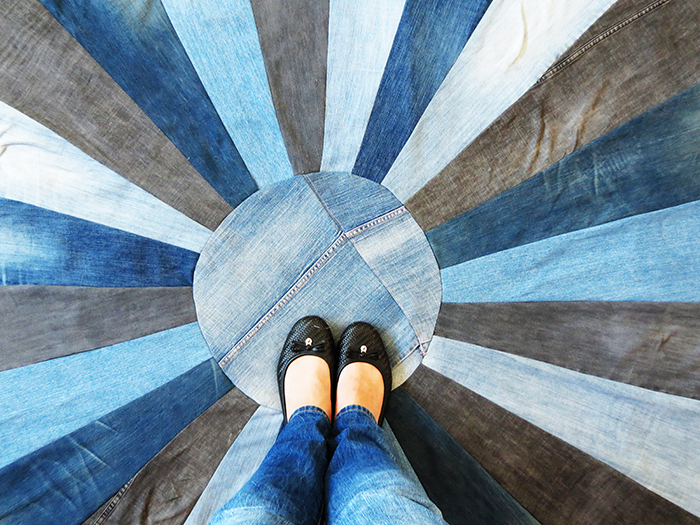 I’ve made all sorts of things with thrifts store denim, but would have never thought of this awesomness! Thank you. 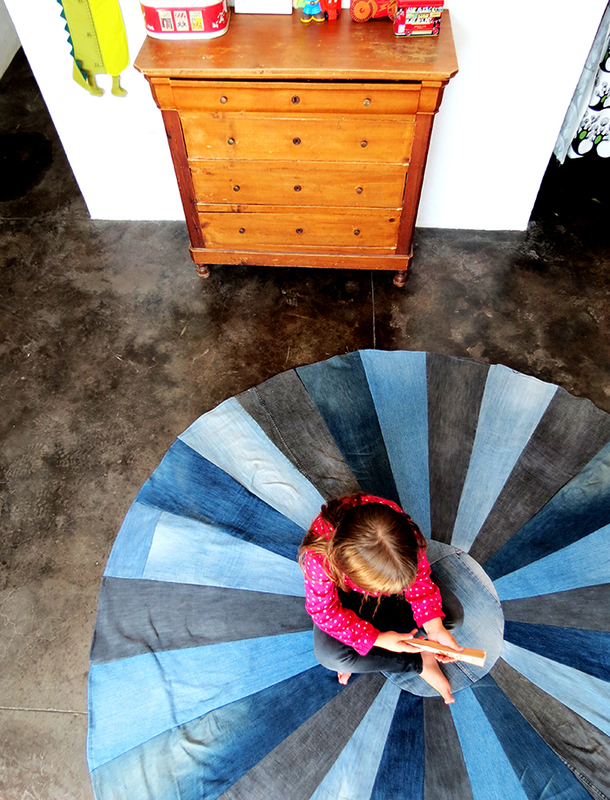 I love this rug idea but I want to make it bigger, that may require the use of the daughters brain for math. Indeed…and you will need a lot more old denims too! Have fun making your rug! Question about cutting pieces. Should I add 1 inch all around each fabric piece when cutting? So instead of 2 inches st bottom, it would be 4 inches to allow for seam? Hello, yes you have to add 1 inch all around the pieces. You are right the bottom will be 4 in. width. You have to sew following the shape marks. Hello Louise, no I don’t sell them. I made this rug for my son bedroom. he first thing you need to do is drawing the pattern to cut out the pieces. Take some paper or cardboard you have around and trace a trapezoid. The large base dimension is 9 1/4, the high 27 1/2 and the small base is 2 inches (in centimeters this will be: 23.5 cm for the base, 70 cm high and 5.5 cm for the small side). 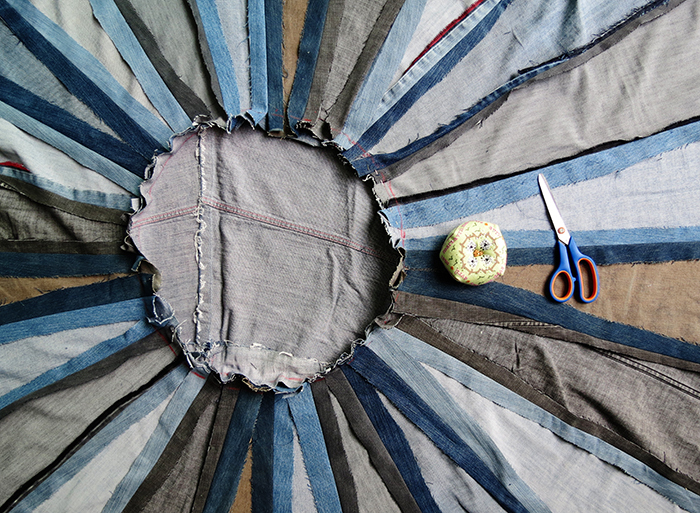 You report the trapezoid shape on the denim and you cut out the piece, leaving 1 inch around for the seam. Eu queria isso traduzido para PORTUGUÊS. Hello Erika, that would be nice indeed…sorry I can’t help you with the Portuguese translation. But maybe someone else around can? finally get around to it, this will be my project! Thank you so much for taking the time to make the tutorial. Omgoodness! That sounds so simple. I can’t wait to make this rug. Unfortunately, I just gave all my wore jeans to goodwill. I’m sure my family and friends will help me with this adventure! So Instarted making this probably.giving it a little too much extra for the seams and thought, “This is gonna be pretty darn huge…too huge…hmmm” I was showing off my progress and held it up in the mirror.to.look then realized if I closed.off the 9 sections that were done…I had an awesome a-line skirt just my size!! I cant wait to add some pockets in the back and maybe some in front who knows? I can wear it to go shopping or even to do some of my heavier duty outside summer chores. Its so durable…I still need to hem the bottom but was so excited I couldn’t wait to share. Thanks so much for the tutorial & inspiration! P.s. This will pretty much work for anyone including little girls. 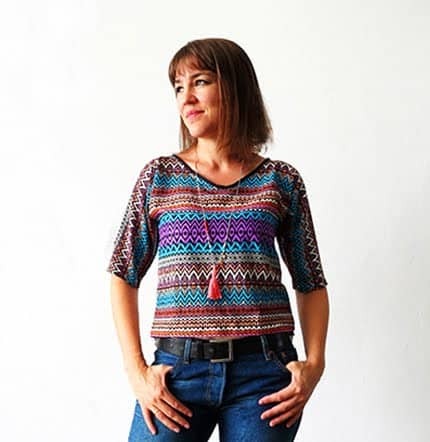 Just add or remove a section to accomodate your waist size and hem to desired length. This is wonderful! 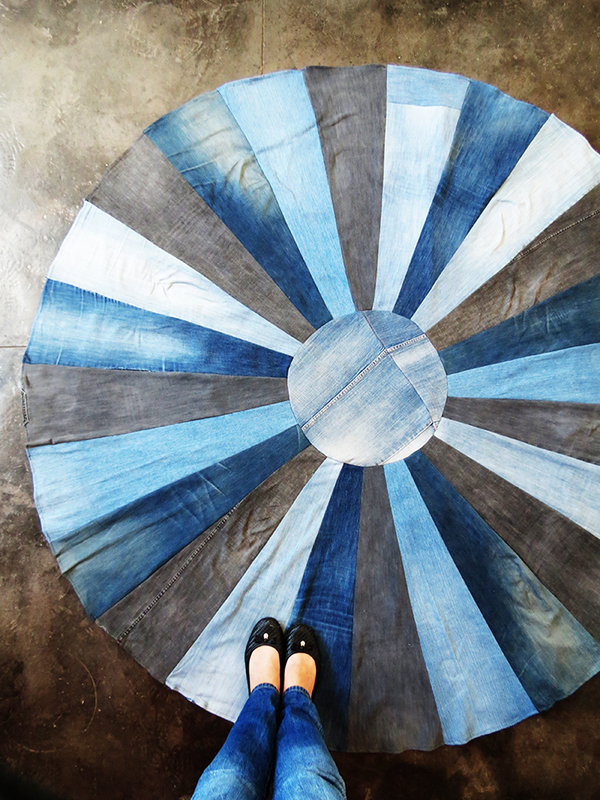 Starting a project to upcycling denim pants into a rug, but ending with a skirt! I love it, very creative!